I scared so many people! This was the annual LOTNA Halloween party, so lots of people brought edibles. The ones in the middle are mine but there were some seriously good things around! It's the best season of the year!! I've been preparing already and even had a few parties so lots of stuff to post about :) First up: this year's costume! A few years back, I was working with a girl with gorgeously long black hair. So naturally when she asked me for costume ideas, Samara from The Ring came to mind immediately. Sadly that meant that that idea was out the window for myself. But no longer! I made my very own Samara dress this year, and it looks amazing! I looked everywhere for a nighty that I could alter, but found nothing for a decent price. Luckily, I still had some fabric left which was warm enough for October and cheap enough to be completely 'Ringed' up. Upon arrival in Greenwich, I finally saw Cutty Sark! The last time I was here it under restoration but now I finally saw it! Walking along the river, all the way to HMS Belfast, such a London pic with Tower Bridge in the background! I hope you're having (or had) a wonderful weekend! Mine was super busy and it all started with a run again :) The last run of the year, at least that's what was planned before I found out about Christmas runs LOL, this one was the most important one as it was for the MS Society. I arrived in style of course in my orange tutu which was very Halloweeny but also matched the MS Society shirt. There were so many runners supporting the charity, it was great! And there was a Stormtrooper who was running with a mini Darth Vader, too cute! The second trail I chose was the one on the riverside. This was super handy as the train from Greenwich brought me right there and I had to go past here anyway on my way to my next event. Perfect! 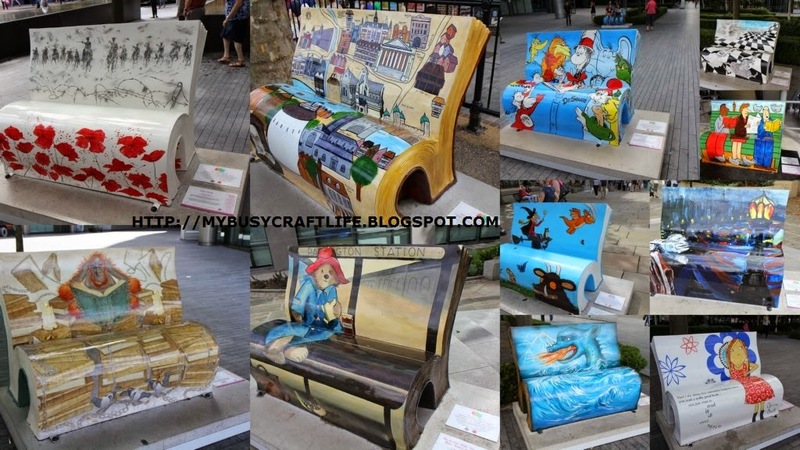 The books on this trail were: War Horse, Shakespeare, Dr. Seuss, Through the Looking Glass, The World's Biggest Flip Book, Discworld, Paddington Bear, Axel Scheffler and Julia Donaldson books, Great Expectations, Clarice Bean, How to Train Your Dragon. The back of Discworld had the Discworld! Am about a week late in posting about this, better late than never! 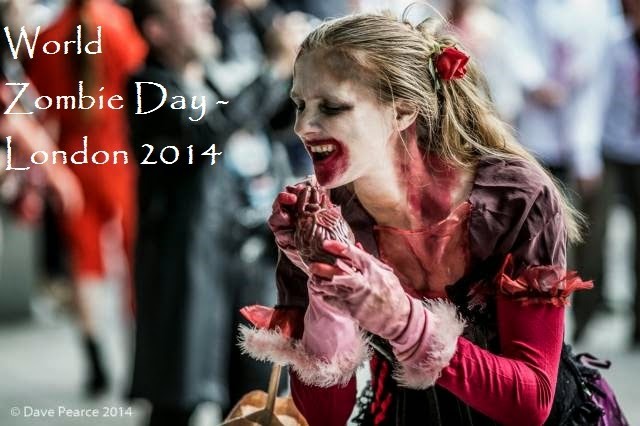 Last weekend it was World Zombie Day, which meant lots of zombie walks around the world. In London, we had our annual walk in aid of St Mungo's hospital. It was great fun as always! A wonderful photographer called Dave Pearce took this shot of me enjoying a 'hearty' snack (I had props this year!). I just love it!! We met at a different location this year but it made for some really good shots. I was super late so I only arrived at the health & safety briefing. There were quite a few zombies and the effort they put into their costumes was amazing. A theater group even brought zombified animals!